Don't take this wrong way — bowls are great, the bowl streak is great, everybody wants to go to a bowl this year. But after that UVA win, I mostly don't care about the outcome of Saturday's game against Marshall. There is no doubt that losing out on a streak that Frank Beamer built (and has for so long been a clear marker of the program's consistency) would be a bittersweet end to the season. It'd be no fun for the players, for whom bowl goodies are a small but meaningful replacement for any sort of wage for putting their bodies on the line for the fans' delight. And it'd certainly be no fun for the coaches, who depend on the weeks-long bowl practices to give younger players a chance at some meaningful reps before spring arrives. Even the fans can get juiced for a good bowl, especially in the (likely) scenario that the Hokies would get tabbed for a modest contest on the East Coast within easy driving distance of the bulk of the fanbase. But the season might as well have ended after the UVA game, for me. Not only is holding on to the Commonwealth Cup considerably more important to me than going to a bowl, but the game itself (as crazy as it was) is the note I'd much rather end the season on. Certainly, keeping up the winning streak is a nice point of pride, a way to tell Virginia recruits you "own the state" and clown on Hoo fans online. These may be small, ultimately meaningless things to care about in such a disappointing season, but I care about them nonetheless. And thinking about that crazy contest with the benefit of hindsight, it contained plenty of elements I'd much rather focus on besides whether or not the Hokies win six games. The young linebackers and defensive ends flashed serious potential, as did Tre Turner, the undisputed star of the game for Tech. Sure, Ryan Willis displayed some of his same old faults, as did the secondary. But it was easier than it has been recently to squint and see the foundation of the next successful Hokies squad among the players making an impact last Friday. Along those very same lines, let's jump into the hottest Tidbits from Tuesday's media availability, which could well be the last one for a while. We'll find out soon enough. As I alluded to up above, the true story of the UVA game to me was the light really coming on for young players, and how exciting that was to watch. Certainly, Dax Hollifield is one half of the equation. As I wrote last week, his energy on the field is infectious, and his aggressiveness has paid dividends on a defense that has struggled. He recorded another fine stat line against the Hoos with six tackles, including one for loss. He wasn't perfect, but as French documented yesterday, he was also a key part of Bud Foster's plan for containing Bryce Perkins after the QB flummoxed so much of the rest of the ACC. While other young players had their moments against UVA — from Tyjuan Garbutt to Dalton Keene — Turner was undeniably the breakout star. Between his 69 yards receiving, incredible one-handed touchdown, punt block and even a 43-yard run, Turner made an impact all over the field. He'd clearly been emerging as more of a force in the offense over the last few weeks, in particular, so it's no huge surprise that he'd make such an impact — although, it would seem he didn't have the confidence of the staff right off the bat. You may recall as well that Turner suffered a season-ending shoulder injury in the September of his senior year, which surely impacted his development. He then enrolled at Tech early to get a jump on learning the offense, and it seems to me we're seeing now what he can do now that he has the benefit of being a full year removed from that injury. 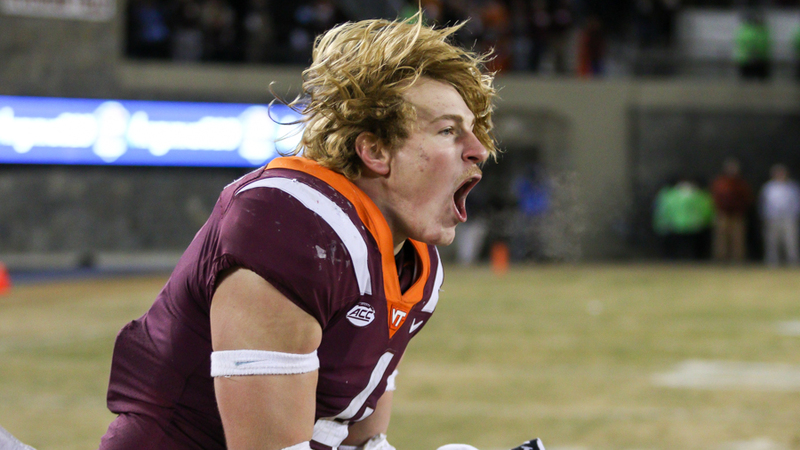 It also strikes me that, as Tuesday's media availability demonstrates, Turner and Hollifield are now well positioned to be the face of the Hokies' program for years to come, if they can keep growing as players. It's a testament of the value of recruiting. It may seem silly to make the simple point that landing highly rated recruits is good, but it's worth highlighting where applicable, especially as we hear the constant refrain that star ratings aren't the be-all, end-all. SB Nation's Bud Elliott never tires of making the point that there's a direct correlation between the number of 4- and 5-star recruits programs land and their eventual performance. Player development is important, of course, but sometimes it really is as simple as recruiting the most talented guys, and Hollifield and Turner certainly fit that bill. Both were consensus 4-stars, and both had plenty of larger suitors, especially because they both hailed from out of state. Yet the Hokies were able to land them, and we're already seeing the difference it's made. Oh, and it helps that they both seem to have plenty of personality. You might've been confused to see Damon Hazelton, Tech's most prolific receiver this season, returning punts against the Hoos, but not involved in the offense. Apparently, that's because he's still dealing with an injury. WRs coach Holmon Wiggins is optimistic about his status against the Thundering Herd, however. If an "emergency role" qualifies as still returning punts, as Hazelton did alongside Turner Friday, then think of what that says about the coaching staff's confidence in the rest of the team's roster of potential returners. Turner managed 23 yards on his lone return of the night, so perhaps he'll see an expanded role on that front going forward. But as his role in the offense increases, it makes it more difficult for him to contribute in the return game as well. Hazelton, of course, hasn't been an ideal option there either. He's averaging just over 4 yards per return on his 12 returns for the year. In all, Tech has ranked a whopping 102nd nationally in average punt return yards, so plainly this is a huge area for improvement for the team to focus on. Beyond using Turner more, there doesn't seem to be an obvious answer, however. C.J. Carroll's retirement and Sean Saboy's departure means there aren't even a ton of options for the team to consider. By all accounts, Justin Fuente has far larger problems to solve against Marshall (and in some hypothetical bowl game). But with an offense that tends to go completely cold for long stretches of games, it strikes me that an improvement to even being simply average in the return game could make a huge difference. Sometimes stories come along that both surprise and delight you. This one, from Mike Barber of the Richmond Times-Dispatch, definitely qualified for me. Virginia Tech's future home-and-home series against Marshall will be played in 2023 in Huntington and 2024 in Blacksburg, Thundering Herd athletic director Mike Hamrick told a West Virginia radio station Monday morning. It's not clear if the exact dates have been set, but a source confirmed that Tech is considering replacing its Sept. 23, 2023, game at East Carolina and its Sept. 7, 2024, home date vs. ECU with the Marshall games. East Carolina was scheduled to visit Blacksburg on Sept. 22 of this year, but canceled because of Hurricane Florence. Another source stressed that no dates have been decided for the Marshall games and they could replace any of Tech's nonconference dates those years. Now, it may be easy to read too much into this. A quick glance at Tech's future schedules reveals that Tech is scheduled to play its last game against the Pirates in 2025, and the Hokies could always opt to kick the can way, way down the road and reschedule those ECU games as the calendar nears 2030 — after all, it's comparatively easy for schools to move around schedules this far out, before anything feels real. But that's not to say that's a guarantee. If Tech does indeed cancel the ECU games in 2023 and 2024, the Hokies' dance card looks awful full in the years immediately following that. Tech already has four non-conference opponents scheduled in 2026, 2027 and 2028. Some of those foes could easily be bumped due to their lower tier status — hello, VMI, Liberty and ODU — while others might be more difficult to change. Notre Dame, in particular, seems like the sort of school Whit Babcock might not want to reschedule too much, given the meaning of those games. So could the Hokies be, if not freed from their Pirate shackles, then at least most of the way there? It sure seems that way. I know I certainly wouldn't be sad to see this series peter out, and I doubt I'm alone on that front. Marshall may be far from the most exciting replacement, but at least the two programs have a little bit of history without having been matched up year, after year, after year, after year. I initially didn't give much credence to the idea that the spat ECU and Tech got into over the hurricane cancellation would impact the series much going forward. But while I'm sure there are other factors influencing Babcock's thinking on this, it's hard not to see some bad blood evident in him contemplating these cancellations, however. I leave you today with the revelation that, among other things, Dax is a bit of a trickster. Bowls are still contractually obligated to take "their teams" first. What's going to shake things up is how many teams from each conference get into NY6/CFP games. * the AAC only has 7 bowl eligible teams so can't even fill all of its own slots if UCF is in a NY6 game, meaning they also can't fill the contingency slot in the Liberty Bowl. On the flip side, if Ohio State makes the CFP and Michigan goes to the Rose Bowl, the B14G would open up a slot that must go to either a MAC team (Quicklane Bowl) or Mountain West team (Redbox bowl) since both conferences have more eligible teams than slots and the games are contractually obligated to take teams from those conferences if the Big Ten can't fill those slots. As American Express used to say, "Membership has its privileges". No way a Power 5 team gets left out with a 6-6 record. There will likely be a 6-6 group of 5 team that gets screwed. So if 4 teams are left out are they still able to practice as if they were bowl eligible? I'm sure the players probably wouldn't want to, but the coaches would. If two schools are nearby, would they be able to set up a small scrimmage or something like NFL teams do in training camp? IF we beat Marshall, VT will have finished the season with 2 consecutive wins against teams that are easily going to bowls. Throw in a convincing road win at Duke and VT would have 3 wins against teams that are playing in bowls. IF VT wins Saturday then they earned a bowl spot. Absolutely. Some smaller east coast bowl will leap on the opportunity to get VT.
Dax is growing on me, next two years of him are going to be great methinks. Dax is gonna be VT's JJ Reddick. Loved by us but he is gonna be hated by everyone else due to his attitude and behavior on the field. This picture is awesome and doesn't need to go away any time soon. Alex (and Mark) hope you don't mind me using it as my avatar for the foreseeable future. I agree with finding someone electric...but the hands - gotta have good hands. Catch the ball comes first...electric 2nd. Would be be better to have someone with a few more years of college play under their belt? but last Friday felt so significant. Never been that elated after a game in Lane. Shibest is one of the highest paid coaches on the staff and apparently doesn't coach "punt returns". Guess being in the top 100 in the country at something is too much to ask.. oh well. And two years prior to this he had one of the best all around special teams units in the nation. I remember Farley being the primary KR earlier in the year, but he seems to have given way for Wheatley. Could be that the coaches want him to focus on only one thing this season. Punt returner - another reason we so missed Tim Settle! Great article Alex. I too am impressed with our new freshmen overlords. I agree with most of what you are saying, Alex. I'm not sure I understand the logic of "this young team is just starting to turn the corner....so I mostly don't care about if they make a bowl game or not"
I absolutely think extra practices would help cement the progress and development this young team has made, and help propel them to a better 2019 season. I personally don't care about the outcome of any potential bowl game, I would be fine with Fuente spending every bowl practice in development for next year. I think not reaching a bowl would stunt the development of these young players. The bowl streak is very important to me. We can't end our streak as Florida State ends theirs, asterisk or no asterisk. I would be fine with Fuente spending every bowl practice in development for next year. I understand the idea, but, taken literally (for example, not even introducing a game plan for the specifics of facing Marshall), I don't think would be a good idea. I believe the players would recognize they are not using the time to prep for the bowl game and the resulting effort of the field would be evident. After a season of less than impressive play, I believe that a stinker in a bowl game would further a negative impression of the future of VT football. Would that sour a fence-sitter recruit considering coming to the Hokies? I really wanna see Rivers, Dax, and Ashby on the field at the same time next year. Probably won't happen, but a man can dream, can't he? But with an offense that tends to go completely cold for long stretches of games, it strikes me that an improvement to even being simply average in the return game could make a huge difference. This is why I and many other fans are concerned about Corney as the OC and play caller. This has been a glaring issue for two seasons now. Otherwise, what has really changed since the new coaches were hired? If the defense stalls or greatly underperforms, it's not very comforting that the offense is incapable of carrying the team to victory on its own. The fact the VT played with a back-up QB through the ACC schedule and may make a bowl means I give OC a pass this year. I'm surprised this thread lasted so long before someone mentioned Florida State. If we extend our bowl streak, we can drop the asterisk after "longest active bowl streak." That alone is worth a lot to me. To lose our streak the same years FSU lost theirs would be sad. This. I gave up hope of passing Florida State for the foreseeable future once they made a bowl last year. The fact that we have the chance to hold the record for years to come is the most important goal for this season in my eyes. Honestly I'd rank it above the UVA streak, but I guess we decided for double or nothing this year.